Choosing the best survival knife for your needs can be a difficult task. Many retailers offer a huge variety of knives with many different features, shapes, and sizes to choose from. From folding multi-tools to large heavy blades and everything in between, the options can seem endless. Having taught wilderness survival course for many years, I've had the opportunity to test a great variety of different knives. There are many knives that will get the job done, though there are some key features that will help you find the best tool for you. In survival situations, your knife may end up being your most important tool. 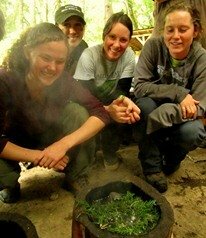 Its used to carve friction fire making kits, cut woody edible plants, and carve trap pieces, just to name a few uses. In choosing a survival knife, sometimes the best place to start is to discuss what isn't ideal. Folding knives, including multi-tools, are often a poor choice. Their blades can fold on your fingers, even if it has a locking mechanism. Folding knives can also break at the joint during vigorous use. Additionally, the angular handles on these types of knives often cause blisters when doing significant carving. In my opinion, another poor choice for a survival knife are ones that have very large blades (greater than six inches). In a survival situation, most of your knife work involves carving. Large blades are very difficult to control when carving and making intricate cuts. I've seen many many people cut themselves severely with these unnecessary large blades. I believe the best survival knife is one with a strong fixed blade, a very comfortable handle, and a blade that is easy to control and not too large or heavy. Pictured at the top of this page are some decent choices. The knife at the top of the photo was custom-made by a friend. It uses a recycled hacksaw blade that runs through the handle to create strength. The small 2.5 inch blade is very easy to control and is superb for intricate carving. 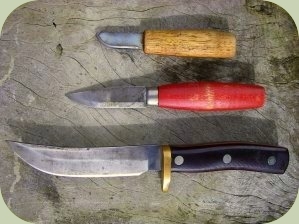 The knife at the bottom of the photo is an Old Timer brand knife with a six-inch blade. The knife is large enough to be used for splitting apart pieces of wood and is extremely durable. One of my favorite knives, considered one of the best survival knives by many, is pictured in the center of the photo above. It is the Frosts Classic Mora Knife made in Sweden. It has a four inch blade and simple handle. The size makes it great for almost any task needed in a survival situation. It offers a good combination of control, durability, and comfort. I have used this knife for many years and am incredibly impressed in how well this simple tool functions and performs. The knife pictured below is the Mora Bushcraft Black. In recent years this knife has replaced my Classic Mora in what I consider to be the best survival knife. The Mora Bushcraft Black has several significant advantages as a survival knife. The fixed blade is 4 inches long. It is made of a high carbon Swedish steel which is incredibly durable and holds an edge extremely well. The flat grind creates a blade geometry that is excellent for survival tasks such as carving and slicing, and is also very easy to re-sharpen in the field. The blade is also coated to prevent corrosion. Another major advantage is the excellent handle. Its shape makes it very comfortable to work with, especially during tasks that require hours of carving. The handle material is tremendously durable and provides excellent grip even in extremely wet and cold conditions - a very important attribute for survival situations. Because this knife has exceeded our expectations in so many ways, we have decided to endorse this knife, offering it for sale here and at our wilderness survival courses. It comes with a durable molded plastic sheath. The knife and sheath have a lifetime manufacturer's warranty.